What is the deal? What time of year is it? Should I have on a tank top and floral skirt?... These are the questions that a lot of people I saw today are NOT asking themselves. Come onnnnn, put your clothes back on. I remember cursing my mother when I was a 7th grader when she wouldn't let me wear shorts to school until May. But now I understand the lifelong restraint and proper etiquette she was instilling within me. Anyway... why am I here? 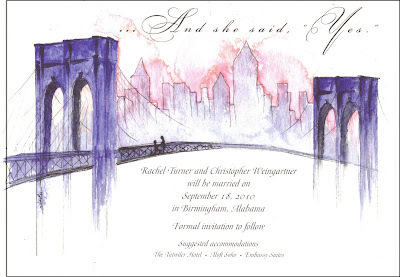 Oh yes, I thought you all might enjoy seeing another custom project I did for a friend's wedding save-the-date. Please don't crash her wedding just because I posted this on here. That would go in the inappropriate decision column with wearing tank tops in March.